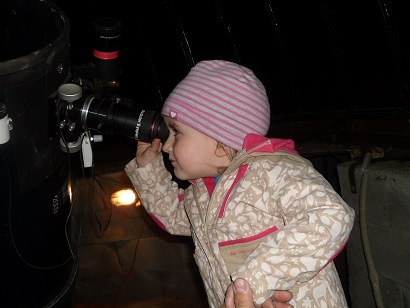 I did little to make my daughter interested in astronomy, as it was always around her from the beginning, and she was interested in astronomy from the earliest moment of her life. First of course she was interested in the "huge" telescope that was always there next to her in the dining room - she was quite worried when the scope moved into its new home into my dome. Telescope and dome were actually among of her first words. I had lots of astronomy related books in her reach, so when she was just one, she opened them regularily instead of her fairlytale books, and watched the images inside (surprisingly, her favorite was a huge book, called "High Energy Astrophysics"). She liked to watch whirling galaxies, stars and the Moon. I tried to put kids' astronomy books to the front of the pile, but she always skipped those. At about 1.5y of age, she easily shown the Moon and stars on the sky. As at 2 she could easily count to 10, she even counted the stars apparent to her. At this age she have seen the Moon already through a little monocular. Now, she's near 2.5y, and just recently seen the Moon and the Jupiter through my larger scope (12" Newt), and enjoyed the view a lot. She also tried to control the scope, but has some difficulties with that. She still has to learn how to view with one eye closed, and I'm not allowed to turn the lights off in the dome because she's a bit afraid of the darkness inside, but she seems very interested in astronomy. But I'm not pushing her into it, so as long as she wants to observe, I support her, but if she decides to become a princess, I'll help her in that too. What a great report and a Wonderful picture. My 2 1/2 year old daughter has been interested in the moon since she was 6 months. Just recently she viewed the moon through a telescope. I'm not sure she saw anything but I'll be trying again next month when it's up early enough in the evening. I think the most important thing is to always have astronomy accessible and if they're interested they'll latch on. If they're not you can't force it. I have a webpage on "Choosing a Telescope" that pays particular attention to telescopes for children. But at the same time, you have to consider the child's knowledge, abilities, and patience. I received a gift telescope when I was thirteen. Much younger than that and I think the telescope should be considered as a shared one, with the parent actually in charge. Looked at your site. Good advice. I've been told by a very experienced sidewalk astronomer, that most kids this age try to focus on the eyepiece lens instead of the object. My daughter of this age clearly focused of the objects, as she told me she sees stripes on Jupiter (although I admit I lied to her and said that it's that bright star on the sky). I guess it's related to how much a kid is used to viewing through things (like cameras, camcorders, and so on). So maybe you should ask her next time to tell you what she sees. I'd be interested in what the experience is of others. I guess i'll go back to what got me interested in astronomy.. When I was a kid maybe 10 years old, my grandmother got me a 50mm Tasco Refractor...I looked at the moon with it...That was about it, but that was one thing that got me interested in astronomy, so I guess a cheap refractor is still effective? Also I echo the previous poster about sidewalk astronomy. I usually setup in my backyard, but setting up on the sidewalk in our neighborhood is a good idea especially with Jupiter up. Everyone is interested in Jupiter and here in a couple months Saturn will be accessible earlier in the evening so that would be another good target. My daughter was definitely look at the eyepiece instead of through it. I'll be trying again around the next first quarter in May. I think with a couple more attempts she'll figure it out. to self-esteem and lifelong scarring caused by getting non-premium optics. refractor, or if a reflector nothing less than Zambuto or Lockwood optics. could cause feelings of inadequacy. join Cloudynights they will fit right in. With my kids I don't encourage anything. I just expose them. Astronomy, hockey, baseball and model trains are all a part of our household. My boys are 7, 8 and 12. Astronomy has caught on the least but it takes the most patience for the least "bang" of a reward in their minds. But they still know enough that they have all (politely) corrected teachers for being inaccurate about some aspect of the solar system. I have 4 kids myself 6-14 yrs old. Mostly they like time with me and then they get to see the "sparkles" through the scope. Always have equipment they can play with. Binoculars on a mount is really good. let them turn knobs and change (cheap) eye pieces. I have set up two scopes before and had them try to point where I was pointing and find what I found. That was fun. I'm not sure kids need premium optics (and I'm not sure if you're just being sarcastic ). I've shown objects to some of the kids in the family (at ages 7-9-10), and I think they were all amazed by the view, in my mediocre optics, because of the story I told them about these objects. Maybe it's a question of how a child was raised: if he grew up between perfect graphics of an XBox/PS4 and perfect 4K image of a TV screen, or if he was encouraged to sketch, play "manual" games and so on. I think the kids closer to reality will not be discouraged by poor optics. I f they don't like what they see is either the lack of information they get next to it (or rather the inappropriate information: for a kid an "exploding star" is amazing, but an "inflated type-G star that threw its outer shell off" is boring), or because they are misled by previous experience with all those "amazing" astrophotos. Edited by starquake, 27 April 2016 - 04:09 AM. I would encourage you to try binoculars with her. Small, low power binos would be best but whatever you have. Don't start with the moon and stars, start with birds and boats and cars. Essentially you will be teaching her how to use the tools. Then, when you go back to the moon, let her look with the tools she now knows, the binoculars. Lay out lounge chairs side by side. You with your binos and she with hers. I purchased a pair of these so when a friend brings their 2-6 year old I can hand them to them with no concern about them being broken. And if the kid likes them, then they can take them home. High quality? No. But they do work well enough to be a training tool that the child can have and handle and use to look. Or something like this. I have a pair similar to this that a child could easily handle but I use them all the time for daytime. I keep them in the car. Mine are black. I would encourage lower power if you can find them. 4X would be good. Wider field of view. She can use them to look at birds in the yard. Get a child's book on birds and spend time looking at birds with binoculars. Go to the park to look at birds, find them and name them. She will LOVE it. Now, when you look through the telescope she will have learned how to look through the eyepiece not at the eyepiece. Great idea. Just ordered a pair for her. Thanks. Edited by Spacefreak1974, 29 April 2016 - 10:27 AM. If you order the Astro Physics scope now, they'll get it when they're all growed up. The very first thing you can try to get your child interested in astronomy is name them after an astronomical object. I named one of my daughters Eridani. And yes, she like being able to find Eridanus in the sky near Orion.